There are several industries where the basic business logic remains almost the same, it is like working Maths sums, where the formulae and basic calculation always remain the same but the numbers and situations vary. Some of these industries include retail, hotel bookings, sites dedicated to penny auction, airline reservation, and social networking. When making slight effort works wonderfully well why to use up all your precious time, energy and resources in building the applications right from the beginning? 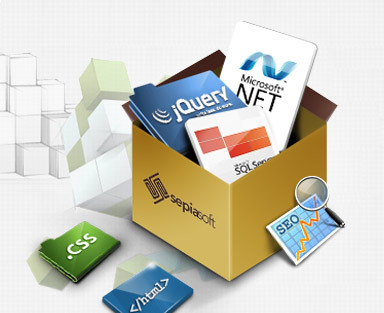 At Adaptative, we offer a special range of ready to use software solutions which only need a bit of customization and slight bit of touch up to fit your business needs. And what makes us different in offering you customized solutions is that we handle the logic in an entirely different and most innovative manner and coming to the designing part, our designs are always in accordance with your individual needs which makes you exceptionally different from other vendors giving you a unique identity of yours. What Makes it an Incredible Strategy? You save significant amount on development expenses. It is a great time saver. Your development requirements are fulfilled within 1 to 3 weeks (depending on your requirements) making it possible for you to start your business soon. None of your important business aspects get missed (even if you've missed them out yourself) providing you with better resource both for the present and the future needs. We offer special advertisement and marketing features to help you grow your business well. We incorporate unique designing and branding with our customization services to fulfil all your requirements. You get after sales support as well as the contract for maintenance. It offers most extensive and truly powerful solutions especially created for the travel industry. The system offers support for several important integrations such as for airline bookings, travel deals, hotel bookings, insurance, and so on. Along with this you also get white labelled solutions specially provided for all the other travel related web apps. None of the important travel related features are left out. Thus you get the features like Domestic and International Ticket Booking, Hotel Booking, Agent Management, Holiday Packages, Car Rentals, Invoicing, Advertisement Management, Commission Management, Reports, and so on. We provide you with every vital agent and client needs. It covers everything starting from Property Listing, Property Selling, Buying or Leasing a Property, Alerts, Profile Management, Property Search, Filter Properties, Reviews, Filter Properties Location related Details, Feedback, Cost of Property, Loan, Insurance and so on. This is the segment where our services are most trailblazing and comprehensive in nature and are designed in such a way that they fulfil the needs of the companies as well as the recruitment agencies. We have expertise in providing our clients with technically most advanced tools specially developed for the job seekers and the employers. Being a popular job portal software development company, we offer most innovative ideas incorporating with your requirements for maximum benefits and complete practicality. Further, we develop various tools such as community tools, custom and engine tools, powerful search algorithm and all inclusive admin console and so on. Other pre customized solutions include scripts for web app development related to auction, deals, and social networking sites which with slight touch up and customization according to your needs create fabulous web apps.